An internally "flawless" 100-carat diamond was on show Monday in Dubai ahead of being sold at auction next month by Sotheby's, where it could fetch up to $25 million. The stone, which was discovered a decade ago in the De Beers mines of South Africa, will go under the hammer at a "Magnificent Jewels" sale in New York in April, the auction house said. The auction house describes it as the "ultimate emerald-cut diamond, weighing 100.20 carats, D colour, internally flawless" and "unlike any diamond offered at auction before". Frank Everett, Sotheby's vice-president of sales for jewelry, told AFP in Dubai that the diamond was "for anyone who really desires the best of the best". Everett said the diamond could be worn as "a pendant on a necklace, or a cuff bracelet or a ring" although someone might buy it "to admire it just as an object in its own right". 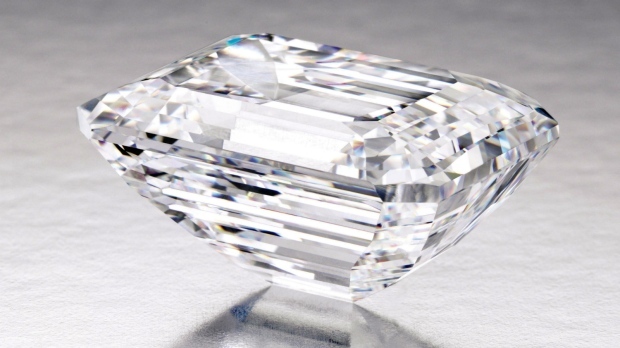 Sotheby's hopes that showcasing this "perfect" diamond in Dubai and other locations ahead of the April sale can help it attract the attention of the Middle East's wealthy elite.